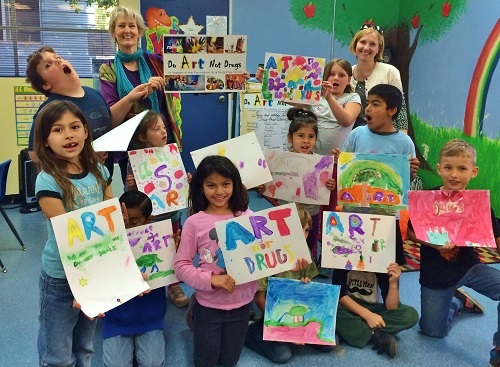 Students Do Art Against Drugs! Home / Do Art Not Drugs / Students Do Art Against Drugs! Had fun this week with a very talented group of students of the Renaissance Academy which is located not far from me in the mountain city of Altadena on a really cool sprawling tree filled four-acre campus. It consists of large classrooms, a science lab, art room, play yards and garden. These students put their artistic talents into action by taking part in a painting activity which I held at the school. 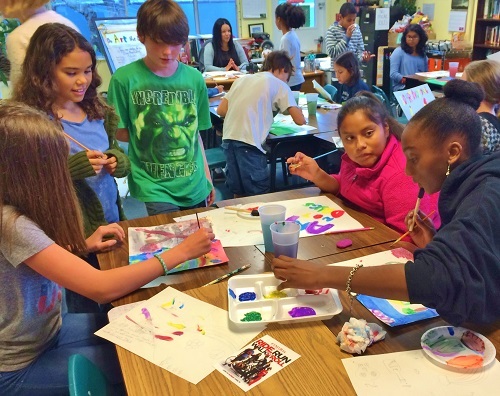 Thirty-five kids from 3rd – 8th grade created their own original paintings — the theme. . . Do Art Not Drugs! I recently started the Do Art Not Drugs initiative to help teach kids to steer away from drugs when first confronted with them and realize that creative pursuits are a lot more fun and far more rewarding. 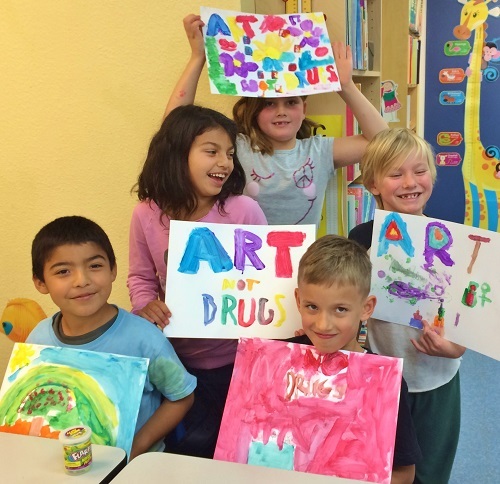 My art events with children also include the distribution of drug education materials supplied by the Foundation for a Drug-Free World, an international non-profit group which distributes it message through effective booklets, Public Service Announcements and documentary films. In additional to the dangers of street drugs it is important for teachers and parents to wake up to an alarming increase in the abuse of prescription drugs by youth. A recent survey revealed that 24 percent of U.S. high school students, some 5 million kids, said that had abused prescription drugs. In fact according to the National Institute on Drug Abuse, prescription drugs account for more overdose deaths among youth aged between 18 and 25 that all illegal drugs combined! Here’s some more scary stats as per a December 2012 CNN news report. It costs the U.S. an average of $30,000 a year to incarcerate an inmate, but the nation spends only an average $11,665 per public school student. 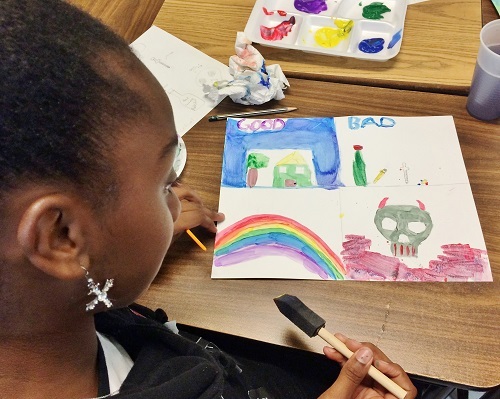 At the same time, art budgets in public schools are being slashed with abandon both here in California and across the nation. In my view, the emphasis should be on educating youth on the dangers of drugs and helping people addicted to drugs break their habits of addiction. And art is such a great way to help that education process. The childrens’ art will be displayed at a public forum entitled Teens on Drugs: Are We Doing Enough? The event will be held on April 7, between 4 – 6 pm at the Church of Scientology of Pasadena, 35 S. Raymond Ave, Pasadena.